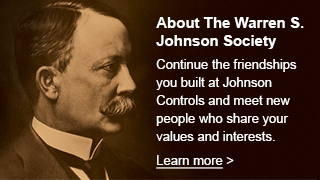 Besides career experiences, members of the WSJ Society share a culture of engagement that is an enduring characteristic of Johnson Controls. Engagement in work and community is an in-career standard for employees at Johnson Controls. While “work” may change in-retirement, “engagement” remains a key factor for personal development and satisfaction. Lifelong engagement is good for mind and body, for community, and, companies thrive in creative, engaged communities. That’s the logic for the “Ambassadors for Lifelong Engagement” event at Reunion 2014. Some activities in retirement require planning and preparation while in-career. Sharing experiences is one benefit for in-career members participating in this event. But that applies also to members already in-retirement. Activities of interest change as needs change in retirement. Sharing experiences is a very simple way for us to help each other. Please be ready to be a bit flexible for this event. It’s the first time we’ve tried something like this! The plan is to have a set of small group discussions on topics of interest, of about 30 minutes duration. The event is scheduled from 12:00 to 2:00 pm, so you’ll be able to participate in up to four discussions. There are currently eight topics identified as listed below. Most of the discussions will take place around tables in the cafeteria area. The tables will have a sign so you can find the discussion of interest to you. There will be a discussion leader at each table. They each have a story to share and will promote a sharing of experiences among all participants. Also, there will be a notebook at each table. If you would like to share your story or the resources you’ve found of value please take the time to jot a note. Jude Anders will follow up with you to capture the details for publication online in the News or Resources pages on WSJSociety.com. In addition to the discussions at the tables, there are two discussions planned to take place in an area with a bit more room. Dennis Miller will have his robot collection on display with his discussion, and Scott Jamieson will have a telescope, battery operated for demonstration, with his discussion. Since they will have hardware, extra space will be necessary. The location is still to be determined, but they’ll be hard to miss! We would like to identify at least one group leader for each of the topics. More than one leader per topic is fine. There will be several group discussion periods. Multiple leaders will allow them share the responsibility. If you would like to share your experiences as a discussion leader, please contact Jude Anders at email: jra4128@gmail.com, or Phone: 414.351.1229.